It takes a Village to get an iPhone battery replacement | Chuckinay! 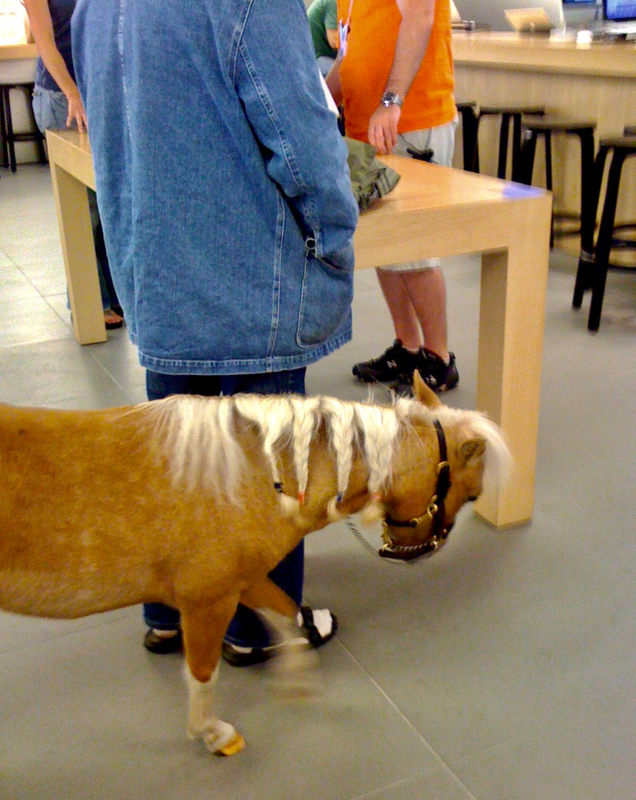 This has nothing to do with my iPhone battery replacement, but here’s a miniature horse in the University Village Apple Store in Seattle back in 2009 — before it got too crowded for people, much less horses. I got a new $29 battery for my iPhone yesterday, not just because I could (funny story about replacements) but because I had to. My iPhone had stopped holding a charge for longer than about six hours. I’m going to walk you through my replacement experience because you might find it informative. Also, I’m long overdue in writing an annual blog post, which means there will be a long <digression> for those of you who do not own an iPhone. You have until the end of the year to take advantage of Apple’s offer, but it might be a good idea to act well before that, as you will see. It’s not quite as simple showing up at the Genius Bar. My iPhone 7 was purchased in November 2016, so I’d had it for 17 months — the warranty had expired. A couple of weeks ago, the battery started depleting rapidly and I was getting 20 percent warnings that I had never seen before. So I went to the Apple website. Among the options for battery replacement, I chose to make a Genius Bar appointment. But when I did, it showed me a small number of available times a week hence, and none of them worked for me. So I called the general support number. Turns out you need to order the battery first, and they let you know when it arrives at the nearest store. Then you leave it with them for 90 minutes while they make the change. But the woman on the phone told me it could take two to five weeks for the battery to arrive at the store. OK, I figured, I guess I’ll limp along until it arrives and be thankful I didn’t wait until the end of the year when everyone else will be trying to get their $29 batteries. As it happened, the Apple Store called the next day and said they had the battery and I could make an appointment to get it installed. Talk about under-promising and over-delivering. I picked Saturday at 3 p.m. When I showed up, it was bedlam as usual. I really don’t like the Apple Store these days. There’s hardly any room to move and it’s never clear whom you should talk to. Everyone with a blue shirt seemed to be in a hurry to go help someone else. I stood in front of the crowded Genius Bar for a few minutes and a guy finally asked me what I needed. I told him I had a battery appointment. “You need to check in with one of the folks in the middle of the store,” he said. Oh, OK. Anyhow, I got checked in and left the iPhone and they said it would be ready in 90 minutes, at 4:30. I ventured out into the Seattle sun and began to wander the mall. We live about a mile from the Apple Store in University Village, near the University of Washington. The Village is an upscale outdoor mall which has really only three stores a guy can enjoy: the Apple Store (OK, maybe enjoy isn’t the word), the Microsoft store (usually deserted) and the world’s first brick-and-mortar Amazon book store. Most of the other stores sell expensive clothing for women. There’s also a Restoration Hardware, which doesn’t sell any actual hardware; a Crate & Barrel, where you can buy neither crates nor barrels; a Room & Board, where you can neither room nor board; and a Storables, where you can actually purchase storables. So I went there and bought a plastic box that I needed. Then I went to Starbucks and ordered a Frappuccino. It gave me an ice headache, ice being the primary ingredient, but watching the people in Starbucks was fairly entertaining. The main Starbucks at University Village (there are two, of course, or is it three?) is crowded with students studying. I’ve never understood how this pencils out for a business like Starbucks. There’s hardly anywhere to sit if you’re actually purchasing something. When I finished my Frappuccino, I went to the Amazon store. There used to be a Barnes & Noble in University Village, and it was enormous, a good place to kill time. But Amazon.com has all but killed Barnes & Noble, and it was replaced by that Room & Board — there being a greater need in our neighborhood for overly expensive furniture than for books, apparently. So it was kind of ironic when Amazon opened its first store about a hundred yards from where Barnes & Noble used to be. It’s not a big store, so maybe it’s right-sized, though I don’t really understand Amazon’s move into brick-and-mortar retailing, at least when it comes to books. Inside Amazon, there are no prices on any of the books. You have to scan the items at a kiosk to find out how much they cost. This is apparently because prices change every second. Then you have to stand in line to make your purchase. A human rings up your items. Again, I don’t get why Amazon wants actual human employees involved in transactions. But the store is a good place to put your hands on a Kindle or try out an Echo. So I was browsing the various Echo models, and a clerk came up and asked if I had questions. I said not really, just browsing, and these things kind of fascinate me, though I’m not sure what I would use one for aside from asking about the weather and sports scores. And by the way, have you seen that “Saturday Night Live” parody? “The one about Echo Silver? Yes,” she said. In fact, after that aired, she said, they added a command that has Alexa say “Uh-huh” as you are telling a story. Huh. Maybe that would make it worthwhile. At that point I figured it was nearly 4:30 and time to pick up my iPhone, though I wasn’t really sure because, well, I didn’t have my iPhone to tell me what time it was. I wandered back to the Apple Store and along the way saw a clock in a jewelry store that said it was only like 4:10, so I sat on a bench outside the Apple Store and watched people walk by. A thing about University Village: I swear about half the shoppers are not speaking English. I don’t really care about that — it’s just interesting. I think U-Dub (as we call the actual university) attracts a lot of foreign students, researchers and parents, so there’s a real international feel to the Village shopping center that makes people-watching more interesting. Most foreigner shoppers are from Asia, but there are more than a few from Europe and the Middle East, too. So I went to look at accessories, one of which was a $1,000 DJI Mavic drone I’ve had my eye on for a few months. I thereby learned that those drones are heavier and smaller than they look on the web. Ten minutes later, my iPhone was still not ready. They ushered me to one of two tables where people wait for service pickups. I waited and waited. Finally, a blue-shirted guy noticed I’d been there a while and asked what was up. He said he’d get to the bottom of it and disappeared out back. When he returned — it was now about 5 p.m. — he had my iPhone and another iPhone-sized box. “I have good news and bad news,” he said. “The good news is you’re getting a new iPhone for $29. The bad news is you’re going to have to spend some time doing a full restore from the backup.” (Yes, I did back it up, and you should too.) Apparently, after they put a new battery in my iPhone, it would not boot up. He showed me. It was in permanent boot-up purgatory, with the Apple logo just sitting there on the screen. So rather than get to the bottom of that problem, someone obviously decided what the hell, just give this guy a new iPhone. In sum up then, I paid $750 for an iPhone with a battery that died a few months after the warranty expired. (Actually, I’m still paying because I opted for 30 months of interest-free installments.) It cost $29 more to extend the life of that iPhone by another, say, 18 months. And when the battery replacement didn’t work, they just gave me a new iPhone. I love the iPhone and can’t imagine switching to Android, but I don’t know if any of this hassle made sense for me or Apple, or if I’ve gotten my money’s worth. Wandering around for a couple of hours without the iPhone was disquieting — distressing, even, for someone who works in the news business. It’s definitely a major thing in my life. Which possibly makes it worth every penny. Or maybe I’m an idiot. When phones were subsidized by cellular carriers and cost $100, it made sense to get a new one every couple of years. Now that we mostly pay full price for the better hardware, shouldn’t that hardware last longer than 18 months? And if it doesn’t, shouldn’t it be easier to change the battery? Alexa, what do you think? This is fabulous. Story of my life. You should definitely post more than once a year. You should make your work memos this short.